"I am a woman phenomenally. Phenomenal woman that's me." I remember the first poem I ever read by her- she exuded a boldness as well as an acceptance that could nudge along any seeking soul. From the books in my younger years to interviews in my mature self, she reminded us all that we were phenomenal and capable of greater love. I remember her for all the snippets of moments. I didn't even know her but she allowed me to better know myself. I remember one time listening to her at a down-trodden time in my life and she made me realize where I stood to improve and how I could move forward with grace. I remember reading I Know Why the Caged Bird Sings and since then, I've held this picture of her outside sitting by the fence. No, I did not share the same experiences that she did in the book, but I've sat at a fence and thought about my life too. I've shared the same sentiments, the same intangible feelings she has. Her poems gave confidence to the timid girl they gave intent to the bold. 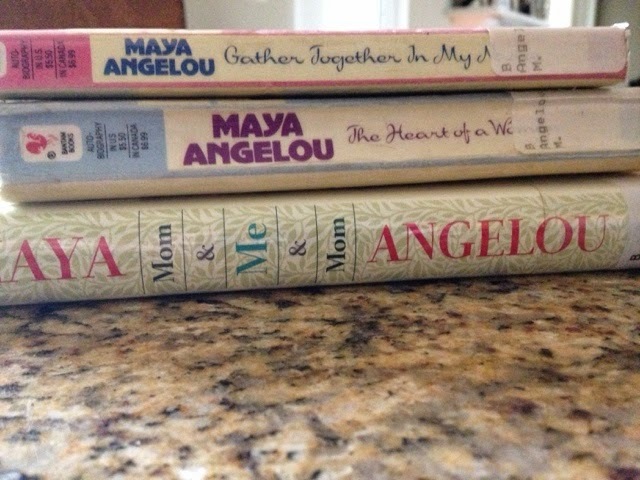 Her thoughts on motherhood were words that were beyond a writer or a poet. They were heart sounds. And her views on faith...Are those that, to this day, I can only admire and hope that one day I can find that type of relationship with God. So why am I teary for somebody who I didn't even know? I guess because I fear that she possesses another nugget of wisdom, or has some other thing to say that would be a help or an eye-opener in my life, except now, I will never know it. So I guess I'm crying for myself. Isn't it always about onesself? Things she said helped me to navigate life better. And now I'm sad because I'm lost for understanding the potential understanding because she's not there to deliver it to me. After saying this shouldn't I realize that she only touched in me whatever I had in me already? It's as if you go to a lake and while looking at the water you have an epiphany. And suddenly you live a better life after that. Years later you come to find out the lake has been drained and the wooded area has been burned. You're sad for the memory and location of an important moment and an integral moment. You're also sad for the potential of more moments and deeper understanding that the lake could have given you. As she said, you may forget what they did but you'll never forget the way they made you feel. I also realized that she was able to rewrite her own stories, so to speak, enough that she no longer blamed those who had done her wrong. She wrote her final book in her eighties honoring her mother, all about her mother. One could say she had a crappy mother- she was abandoned, hit, exposed to inappropriate surroundings for a child, but Maya didn't begrudge her so-so mother. She acknowledged her mothers shortcomings as part of her, but honored her strong points as the prominent story. She didn't regurgitate her own injustices, but danced in her fortunes. Maya stood tall. God bless her.